Delivers wireless charging safely and efficiently. 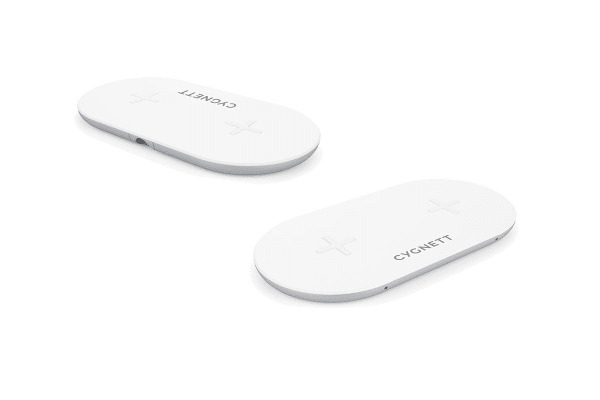 The Cygnett TwoFold 10W Dual Wireless Desk Charger+ DC Wall combines the convenience of dual simultaneous wireless charging with a sleek and elegant design. The Cygnett TwoFold 10W Dual Wireless Desk Charger+ DC Wall can simultaneously charge two compatible devices in lay flat mode whilst keeping your desk or home office clutter free. The TwoFold offers Qi Wireless compatibility with iPhone 8, 8 Plus and X along with Samsung Galaxy devices and other Qi compatible devices. The ultra-stylish design and convenience of the TwoFold make wireless charging the optimal charging option for your new digital device.